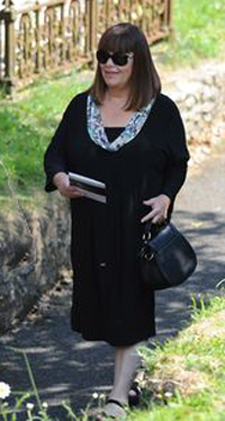 Just caught sight of our favourite model wearing c h e s c a in the Daily Mail-the fabulously funny Dawn French. Wearing our cowl neck shift with opal sequin print collar, she always is a credit to us for every occasion. This jersey dress is stylish and comfortable, and oh-so-flattering. 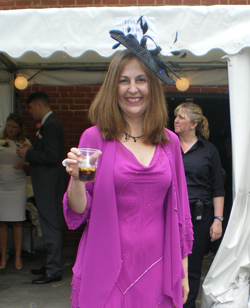 Our stunning pink chiffon dress and jacket was spotted at Ladies' Day at Royal Ascot, a welcome change from the short sharp shift which is the uniform for Races. A touch of sparkle on her hat and dress, this really flatters the curves -a new idea for the Duchess of Cambridge? 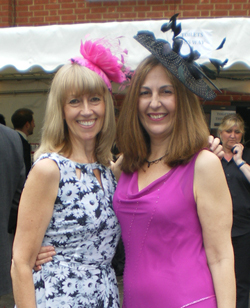 Also seen at Ascot , our unique rose feather hat, a concoction of feathers in the shape of a rose-- the lady who sent the pic in says she had dozes of compliments on the day in our exclusive headgear- if you have a Summer wedding to go to how about one of these as an investment? Down under Dawn!A warm congratulations to Dawn French (form nother Dawn) on her new show in Oz and the new man in her life! and a big THANK YOU for wearing chesca from our violet story-- doesn't she look stunning -front page girl! This is part of her working wardrobe for her trip—it’s my favourite, and she is getting another in pink! The mother of the groom likes to look her best on a wedding day but that isn’t always easy for plus size women, since most of the best outfits are tailored for smaller sizes. Finding bridal clothing you like is the easy part but it isn’t always available in larger sizes, which means having to shop in several different places to find everything for a wedding, whereas Chesca stock it all in one convenient location, but more importantly their sizes are guaranteed to be a perfect fit, however, anything that isn’t can be altered. 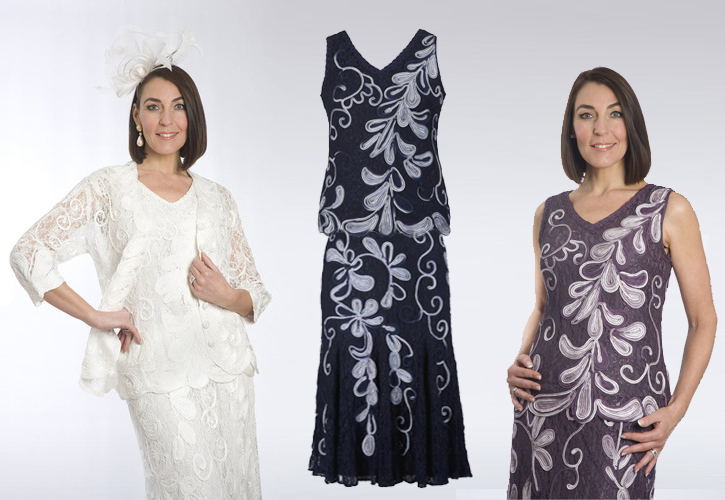 The mother of the groom should be able to concentrate on her son’s wedding without having to worry about embarrassing lumps showing in her dress or wedding gown and Chesca’s bridal range will certainly have something that will dazzle everyone. The mother of the groom would look glamorous in the Pearl Beaded Lace Bolero or the Cornelli Embroidered Trim Jacket, which is available from sizes 12 to 26. Chesca know that plus size women like to look their best just as much as regular sized women and that is often forgotten about by many of the high street fashion lines. The mother of the groom should be pleased with the bridal range available at Chesca and everything on display will be available in any size in the 12-24 range, although sometimes higher sizes are there too. If something isn’t an exact fit then it can be altered and no alteration is too small at Chesca, since having the perfect fit is paramount for the mother of the groom. Many popular fashion designers seem to think that only supermodels like to wear the best clothing and that is simply wrong. It’s fair to say that a vast majority of the population has some embarrassing lumps or bumps somewhere on their body, although many would neglect to admit it, either way Chesca is fully aware that everyone has a slightly different body shape and that is reflected in their clothing designs, even their bridal wear. The mother of the groom doesn’t need to worry about showing the wrong curves on the wedding day since Chesca ensure that only the most appropriate curves will be on show and the rest will be subtly hidden from view. Any of their outfits can be adjusted to ensure the most comfortable fit and more importantly allow plus size women the chance to look fashionable without being self-conscious of the figure. The mother of the groom won’t need to worry about a thing when shopping at Chesca because they pride themselves on offering customers premium quality clothing that has been fine-tuned over many years to fit plus size women with precision. They use customer feedback take customer opinions very seriously and proactively use that information to improve their products, which means they have improved with time and will continue to improve as more people choose to use Chesca as their primary clothing source. The mother of the groom and other plus size women will never have to worry about finding the perfect outfit again.